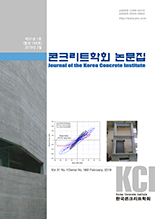 이현호, 김진호, 노광근,(2012).섬유보강재를 이용한 RC 기둥의 보강 효과.콘크리트학회 논문집,24(4),473-480. 아라미드 FRP로 보강된 RC 기둥의 전단보강효과를 평가하고자, 구조성능 실험을 수행하였다. 실험변수는 아라미드 시트 및 스트립 보강이며, 총 4개의 실험체를 대상으로 하였다. 실험 결과는 비보강 실험체를 기준으로 보강효과를 강도 및 에너지 능력 등을 평가하였다. 평가 결과 아라미드 시트보강이 강도증진과 아울러, 에너지 소산능력의 증진이라는 측면에서 매우 유효한 것으로 평가되었다. In order to develop an effecive seismic strengthening metghod for existing concrete structure, structural tests of aramid FRP reinforced RC columns are performed. The test variables were strengthening methods of aramid sheet and strip. The test results were evaluated by comparing strength and energy dissipation capacities of non-reinforced and reinforced specimens. The test result comparison showed that aramid sheet reinforcement on RC column was evaluated as the most efficient way to increase strength and energy dissipation capacity.